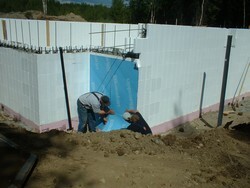 The month of July began with installing water proof membrane to the foam walls of the basement. This took some time due to the fact that the temperature needed to be above 65 degrees in order for the tar adhesive to be applied. 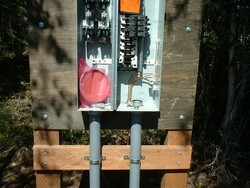 Also, Karl worked on installing the power meter base in order to be added to the electricity waiting list. Now we wait four to six weeks for the electric cooperative to come and dig the trench and set up the transformer. From July 7-17, a framing team of 15 people from Lake City Community Church (LC3) arrived and were able to frame the entire house in just 10 days! Each day started out with the professionals doing the layout of the walls. After that was done, all the other workers jumped in, took direction, and worked hard. It was wonderful to see the cooperation and how it took the entire team to get the long walls (44 feet) of the house standing upright. Another group of workers from LC3 came and worked on electrical, plumbing, windows, and siding during July 22-31. When they were finished, the electrical, waste water plumbing, roof and window installation were 100% completed. Also, the freshwater plumbing and siding are nearly complete. In between the two LC3 teams we were able to begin some work for VFCM. 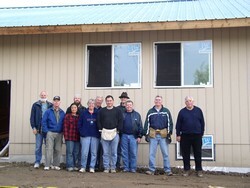 A construction team from Georgia was at KAGV 1110AM to help finish the studio building. We assisted in facilitating the team with procuring materials as well as completing some insulation, painting, and soffit work. Recently the computer that runs all the programs and music for the radio station died. We were able to tag-team and minimize the time that KAGV was off the air. 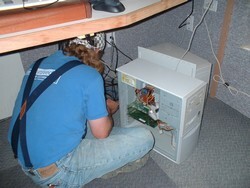 Karl removed the hard drives from the old, dead machine while Kristan prepared the older spare computer to run the on-air software. Dave, the station manager, played CD’s in lieu of our regular programming and in the end the station did not have more than a few minutes of "dead air" (time when silence was going out over the airwaves). It also has been fun to meet new people as we have begun forming relationships with businesses in the community. We love seeing people’s faces when we share that a group of Christian volunteers are building our house. Many of those people who we assume to be non-Christians, are amazed at the sacrifice of the work team members, the way in which the teams are functioning together to get the job done, and the speed at which all of this is happening. It is evident that God is using the work teams to witness to the community of the Matanuska-Susitna Valley here in Alaska. Still Needed $263 4 Goal Met! It is amazing to think that it has only been one month since we last wrote to you. There has been so much that has happened over the past four weeks! 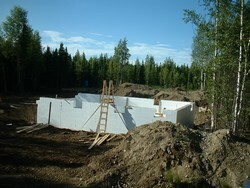 Karl was in Alaska for the first two weeks working with Brent Work on the foundation for our house. During this time, Kristan was finishing up the last of the 2005-2006 school year at Jason Lee Middle School in Tacoma. It was a mixed departure. Kristan enjoyed teaching, her students, and all of her colleagues. Yet it is quite exciting to be following God’s will in moving to Alaska. From the University of Washington, Tacoma, Kristan also was granted her Master’s Degree in Education during this time. 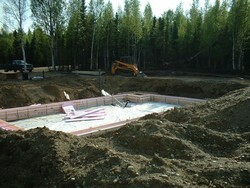 Karl and Brent returned from Alaska on the 11th of June after getting the foundation started. 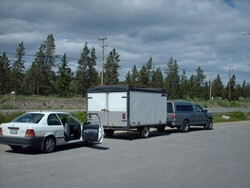 We left Tacoma on the night of June 16th with our car, pickup truck, and our snowmobile trailer. All three were packed with the last of our material belongings and we started up Interstate 5 around 9:00 PM. Due to the fact that our 12’ trailer was filled heavily with only one axle and passenger rated tires instead of more sturdy trailer tires, we had difficulty keeping it from fishtailing behind our truck. After a few days we stopped and replaced the tires and also added a weight-distributing hitch. These improvements created a much more pleasant drive. Since arriving in our new home town, the styrofoam forms for the basement walls were delivered. Karl and Kristan were able to begin building the blocks before Karl went back to Washington to finish one more week of work for Intel. The foam blocks are like giant Lego blocks that fit together to create a form to pour concrete into. 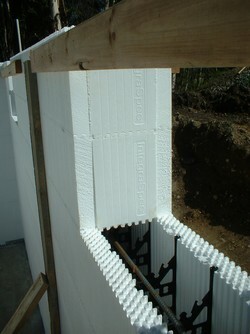 This type of construction allows our home to be better insulated from the cold winters here. The concrete was poured on Thursday June 29th, and now we have the basement walls! The garage slab is scheduled to be poured after the 4th of July holiday. 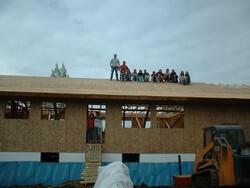 Just in time for the work teams from Lake City Community Church to come and begin framing. Our home church, Lake City Community Church (www.lc3.com) is sending two work teams during the month of July. The first team will arrive in Alaska on July 8, leaving July 17 and the second team will arrive July 22 and leave July 31. Please pray with us that God will provide safety for these teams and that all members of the teams will be blessed by assisting the ministry here in Alaska through working on our house. Over the past month alone we have been so blessed by God we wanted to share so that you can be praising God with us for his very practical love and guidance. Karl and Brent Work left Washington on May 19 to head for Alaska. 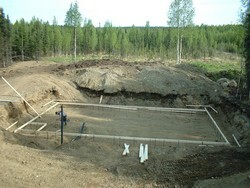 They began construction on the foundation for our home. In less than two days they went from the hole in the ground to having footers framed and ready for the concrete truck. Since that time, things have been slowing down. Our supplier for the styrofoam concrete forms is having difficulty delivering the product. Please be praying that God would bring the necessary materials together to finish the basement as much as possible before the framing crew arrives. Also, please pray for us to wait on God’s timing even if that means the construction doesn’t go according to plan. The war is on! 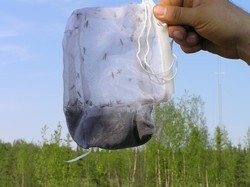 Alaskan Mosquitoes versus Karl and Brent. 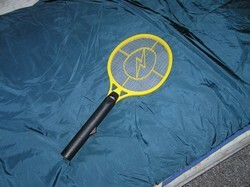 Certain necessary weapons for this fight include a battery-operated mosquito zapper and the all powerful propane mosquito vacuum. Still Needed $419 6 Goal Met! We hope that your Easter was spent with family and friends celebrating the resurrection of our Lord Jesus Christ. We spent our Easter moving out of our Lakewood house into a friend’s house in Parkland, Washington. It seemed very fitting to be starting a new life on the day that Christ arose to give all humanity new life. After some work and a little tender loving care, our house was finally ready for sale in the middle of this month. 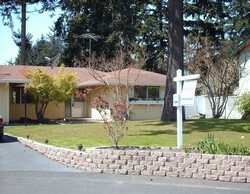 Thanks to Tony Oury and Jan Rich, our Lakewood house was placed on the market on 04/20/06. 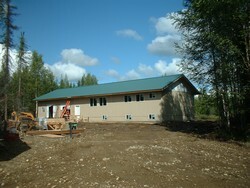 Please pray that it will sell quickly and free up the equity for building materials in Alaska. Karl was able to book passage on a barge to Alaska for our semi-trailer. The trailer will leave on the May 5th voyage and should be in Anchorage approximately 10 days later. Again, we were the recipients of God’s blessings when Nichols Trucking Company moved the 45 foot trailer from south of Olympia to the Port of Seattle. Thank you! 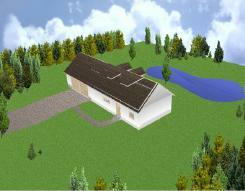 Around the 20th of May, the foundation work on our house is scheduled to begin. Pray that the weather in Houston, AK will cooperate, there will be no injuries to the workers, and the time spent will be productive in order to be ready for more construction in July. We have been having a great time meeting new people at home groups as well as in Naches, WA at Nile Valley Community Church. Special thanks to Reg and Richard for helping us make these contacts. HEATING UP . . .
We can definitely tell that the time for us to depart for Alaska is getting closer! In the last two days we have recruited a real estate agent to sell the house and have made arrangements for the carpets to be replaced. As we prepare our house for sale there are so many things to do, cleaning up and making minor repairs. BUSY! BUSY! BUSY! As for the next couple of weeks, we will be visiting with small groups in order to share God’s work in Alaska and invite them to take part in it. We will also be visiting a church in Naches, Washington. Please pray that God will go before us in each of these situations and prepare the hearts and minds of people who He would have participate with us. March has been a very joyous and very full month for us! During the first weekend, we had a wonderful time with Bob Eldridge (VFCM General Director) at our very own Lake City Community- Church. 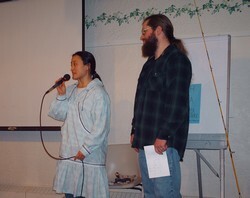 Together we shared God’s vision for His radio ministry in Alaska. Karl displayed his technical skills, while Kristan donned her radio voice. Bob brought a stimulating message and reminded everyone that God will work through you as long as you are willing to follow and trust Him. During the second weekend of March we were able to catch up with old friends from Kristan’s high school years. Thanks Dave and Suzanna for a wonderful time. We also got to join with the congregation of Shelton Bible Church for Sunday service, it was a fun time to share and visit. The third weekend found us in Oregon visiting with Karl’s childhood friends and sharing with Independence First Baptist Church. We even had the opportunity to take in a dramatic musical based on C.S. Lewis’ Chronicles of Narnia. Mr. Tumnus’ performance was absolutely riveting! Both individually and as a couple, we have set some prayer goals for this year. The more we pray and take time out for God, the more He answers and blesses. Please be in prayer with us that our house here in Lakewood will sell quickly in order to free up the equity to begin building our home in Alaska. Our future home in Houston, AK seems to be progressing well. We are working on finalizing the building plans and preparing to purchase the materials for the foundation. Karl will be going to Houston during mid-May/early-June to complete the foundation for our home. Please be in prayer that this process will go well in order to welcome work teams from various churches beginning the 2nd week in July. Sunday March 5, 2006 will be our commissioning from Lake City Community Church our sending church. Bob Eldridge (General Director of VFCM) will be with us to help us celebrate. We also will be participating in a missions program dubbed “North to Alaska”. During this time, the LCCC missions committee has planned some fun games and good food. It is here! 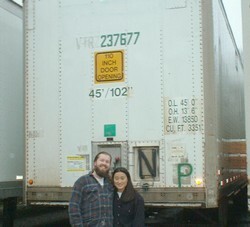 We are so excited that the time has finally come for us to begin moving our possessions into the semi-trailer. 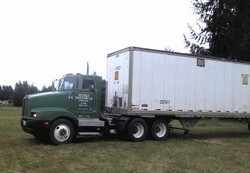 Earlier this month, our 45’ semi-trailer was delivered to its temporary home south of Olympia. We have spent our weekends moving furniture and packing the trailer. We are continually amazed at how God is teaching us to rely on Him each day in new ways. He is continuing to grow our financial and prayer support each month and we are praying for those who are sacrificing to be blessed. We will be sharing at Independence First Baptist Church in Oregon on March 19, 2006. Please pray with us that the time will help us get closer to our goals. This 45 foot trailer was purchased on 01/16/06 and will be used to move our home furnishings and some building materials to Alaska. KIAM in Nenana, AK is still being run by one full-time missionary announcer and a very faithful volunteer from Olympia, Washington. Thank you Mr. Wilmes! 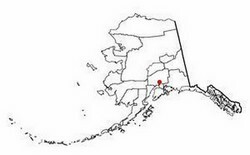 KYKD in Bethel, AK is experiencing some difficulty with the radio transmitter and is in need of repair. Please be praying that God will provide an engineer to fix these issues. Things in Houston, Alaska seem to be going well. The KAGV radio transmitter has had only minor hiccups and Houston finally received some serious snow! Below is a recent picture of the land that we will be building our house on. During this last month we have been given the opportunity to speak about VFCM and our ministry with four different groups of people. We were also blessed with a financial gift from the Native Gathering in Tacoma. We are truly appreciative. In March we will be traveling through Washington and Oregon. We hope to share with you if you are interested in joining our support team. Let us know if we can stop by. We hope that this note finds you already celebrating the birth of our Lord Jesus Christ. May you have a wonderful Christmas celebration with family and good friends. Since our last newsletter we have had the opportunity to speak with our home church, Lake City Community Church (LCCC). The mission board was eager to hear our vision and accepted us as missionaries. 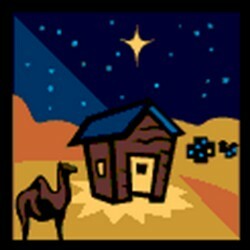 LCCC is also arranging a work team to frame our house during the second week in July, 2006. We would like to meet with you face to face to share about the ministry of Voice for Christ and what we will be doing. We are traveling by car from southern California back to Washington from December 28 to January 2 and we hope to take advantage of this opportunity to meet with you. If you or your small group would like to set up a meeting, please contact us so that we can make arrangements. This summer we will be moving to our land near the new station, KAGV. 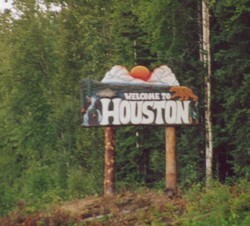 KAGV is located in Houston, Alaska (not to be confused with Houston, Texas). Houston is a very small town of approximately 1300 residents. It is on the road system, unlike many of our transmitter locations. The nearest sizable town with multiple grocery stores is Wasilla, about 20 minutes to the south. Anchorage (the State’s most populous city) is roughly an hour and a half away. The radio network’s headquarters are in Nenana, AK which is very nearly 250 miles north on the Park’s Highway heading toward Fairbanks. This year in Houston, on Christmas Eve, sunrise will be 10:19 in the morning and sunset will be 3:37 in the afternoon. Next year on June 21st the sun will rise at 4:14 AM and set at 11:47 PM. The Little Su River runs through town about 3 blocks from our land. 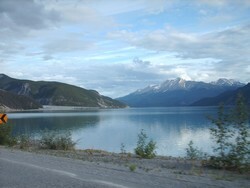 The Little Su is a popular fishing spot for many sport fisherman from Anchorage. Nearby towns of Big Lake and Willow are known for winter recreation. 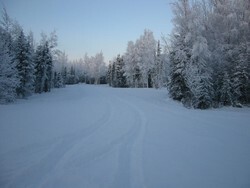 Big Lake is a very popular snowmobiling area. Willow is often the start of the thousand mile Iditarod sled dog race to Nome. As you can see in the Monthly Support Goals table, God has been moving since our last letter. This has been very encouraging. There still is a long way to go. We are depending on the Lord to work through individual contributors for the majority of our financial support. We hope to share with you if you are interested in joining our support team. Please use our contact page to let us know how you would like to participate. If you can commit to pray please send us an email or send us a note letting us know of your commitment. We will be sure to include you in our prayer email updates. Apologies first to Short Circuit fans, but we have had prayers answered in an exciting way. When we move to our new homesite in Alaska there will be multiple locations within less than a mile of each other (see the "land purchase" map in our picture section) that we will need go between, running errands. There will be our home, the KAGV studios, the KAGV transmitting facilities and the post office (our mail won't be delivered to our home). 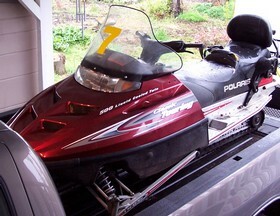 For a large portion of the year, snowmobile transport will be very effective for this need (it is also a lot of fun). 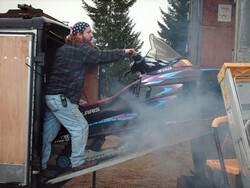 Way back in March we purchased two snowmobiles for this purpose. We wanted to use the money that God has given us wisely, so we were looking for an opportunity to save money even if it meant adding significant elbow grease. 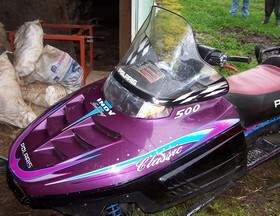 On ebay we found two snowmobiles that fit the bill for a very small amount of money. 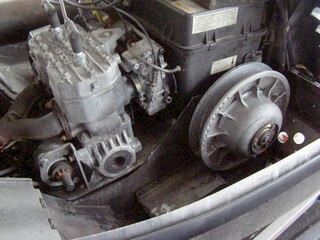 One was running and the other had significant damage. As time and budget allowed we have been working to bring "Number 7" back to life. 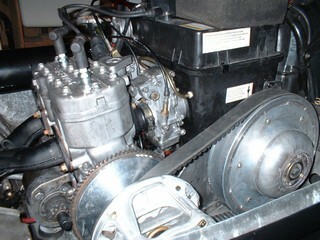 "Number 7" had sustained a broken crankshaft and subsequent destruction of the belt driven transmission system. Yesterday was the moment of truth. After many months of learning, wrenching, sewing and getting covered in grease "Number 7" belched out a big cloud of smoke and came to life. It was a thrill to scoot up and down our 30ft driveway. God has blessed us. Great news! The McCarthy translator is operational. Check out the updated coverage map on our "About VFCM" page. We believe that God is calling us to serve Him through Voice For Christ Ministries (VFCM). It is our desire to be fully supported so that we will be able to serve together in the great state of Alaska. According to VFCM policy, full-time service would mean that both of us would be working an average of 50 hours per week. Karl will be a radio station engineer and maintenance man. His duties will include things such as audio editing, broadcast equipment maintenance, and general building repairs. Radio announcing and hourly sponsorship sales would be Kristan’s primary duties. She will also be asked to host various listeners and supporters of VFCM. Most of you already know that at the end of July, we were blessed by being able to purchase land on which to build a house. See our pictures and the August update below. Currently we have begun the design phase of construction and have preliminary ideas about the size, type of construction, materials, and general layout of a house that we can afford. Our goal is to hire a contractor to pour the foundation in the Spring of 2006 and to have the house “dried-in” before the winter of that same year. In order for us to be missionaries with VFCM we need to raise a total of $2844 each month in financial support from God’s people. We are also asking for 50 prayer supporters who are willing to pray for us on a regular basis for an approximate total of 150 prayers each month. Please be in prayer asking God how you might be involved in supporting us. We welcome your monthly financial support in small denominations and hope that you might be an integral part of our ministry by supporting us in prayer and with finances. We would like to take this opportunity to thank those of you who have already responded. We are excited to tell you that God has blessed us with the purchase of some land in Alaska! Our land is adjacent to the radio tower site and diagonally NorthWest of the studio building. This close proximity will allow us to walk to work and allow us to be available without significant disruption. The 10-acre lot has two home sites that have been started. The home site sitting furthest to the West on our land has been dug for a house with a crawl space underneath. It has a septic tank already installed in the ground. We don’t know what God would have us to do with this site yet, but perhaps it will be for future missionaries coming to serve with VFCM. The home site that we would like to build our house on is in the SouthEast corner of the lot (which is closest to the radio tower). It has been dug for a house with a basement and already has a septic tank and a well. Behind this site, is a small pond that may be a refuge for wildlife. Our current plan is to begin building up this site as soon as the earth begins to thaw in the spring of 2006 and at least get “dried-in” before the cold weather comes. Check out the "Land Purchase" pictures in our picture section. God has also provided us with a small ATCO building (like a trailer without wheels) as a place for us to stay during the construction of our home. This building is currently sitting on the tower site where we spent two weeks living in it this last winter when we were at KAGV. Please join us in thanking God for this property. Also, we ask that you be in prayer with us, as we ask God how to build our house. We are at the begining of the design process with minimal experience. We hope to build with a great deal of the work done by volunteer teams. Can we interest you in coming up to help us out? We are at the begining of our support raising process. So far the response has been slow. Please drop us a line if you know of opportunities for us to get the word out. Check out the June 30th update for Ambassador, Prayer and Financial letters with details on how you can help. Karl and Kristan Thieme are sending warm wishes to you from the state of Washington. Currently, Kristan has just finished her first year teaching special education in the middle school setting. This past school year has been both challenging and exciting. Kristan is 9-quarter credit hours away from her Master’s Degree in special education. Karl is in his tenth year working for Intel. He enjoys designing and debugging designs for server systems in the Root-Cause Engineering group in Dupont, WA. As many of you know we have a heart for missions. This sounds vague and frankly, it has been. We both enjoyed working with orphans and village children in Romania. We have been listening and praying with anticipation as we hear updates from humanitarian work in China that our church has been a part of. Helping visiting missionaries with the use of our car has also been a pleasure of ours. We have enjoyed all of these opportunities and now the time has come for something more concrete. Over the past three years, we have been involved with Voice For Christ Ministries (VFCM) through our local church. VFCM is a ministry that broadcasts Christian radio specifically targeted to rural and native Alaskans. Familiar radio programs such as Unshackled, Money Matters, Focus on the Family, and Insight for Living are transmitted in multiple locations across the vast state of Alaska, 24 hours a day, 7 days a week. If you are interested in more information about VFCM, we can make available a professionally produced DVD that clearly explains the work of this ministry. 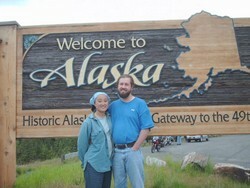 When Karl was eligible for a two month sabbatical from Intel in 2003, we jumped at the chance to go to Alaska. Taking the ferry on the way up and driving our truck back, we went to help with the radio station computers and explore the ministry for ourselves. Almost instantly, Karl saw numerous opportunities to serve. His skills, formal education, and interests were all tapped to do things such as sound editing, mechanical repairs, and engineering work. Karl has been working with sound equipment since he was 14 years old and hoped to be a radio engineer when he was in high school. For Karl, this ministry was a dream come true. After a week of working on computers with Karl, Kristan was ready to move on to a new challenge. Following an intense six days of training and practice, Kristan was ready to try radio announcing. Kristan enjoys the challenge of "ON-AIR" radio announcing because improvements can always be made. Together we recognized the fit between our skills, desires, and the type of mission work to be done. God has formed our personalities and experiences to prepare us to serve with VFCM. Alaska is different. Many of our friends and family voiced concerns about harsh weather during the winter season. The thought of regular winter temperatures in the -40s made us shiver, but we wanted firsthand experience. We have returned for two weeks each winter since our initial visit. The first winter was at the northern station in Nenana, AK where we experienced -35 degrees and 4 hours of daylight. Our second winter visit was to the new station in Houston, AK. The temperatures were milder in Houston measuring -10 degrees. We were surprised at just how much can be done outdoors when you are prepared for these types of winter weather conditions. Together we see that God is calling us to leave our lives, as we have comfortably known them and go to Alaska to serve with VFCM. This decision was not made flippantly. We realize that this will be a big change for us and we are preparing for a lot of challenging, hard work. We also know that God is working through this ministry to bring the Alaskan people to Him, and has called us to be a part of it. Our plan is to move to Houston, AK to be stationed at KAGV 1110AM (the new radio station). We will be making the transition after Kristan completes her degree at the end of May 2006. Currently we are planning to purchase land and build a home near the station. As many of you know we both have very independent personality types. This has its advantages when facing big challenges such as this, but it also has drawbacks. This independence makes it hard for us to put our trust in anyone or anything other than ourselves. This is wrong. We must trust in the Lord. He has called us to do something beyond our own ability, He will provide and the glory will be His not ours. We have decided, after much struggle with our own desire for independence, to seek to go to the mission field fully financially supported. Our desire is to work together and truly the two of us together are greater than the sum of our own contributions as individuals. As fully supported missionaries we would be able to serve VFCM in a larger capacity than if we depended on external income. In addition, we can continue to serve with the ministry if and when children become part of our family. We realized that anything short of seeking full support would be hindering God’s work in our lives. 2. Church Ambassadors - Prayer and financial support are critical. Would your church be interested in supporting us and the work of VFCM? We would gladly provide you with information and materials for you to pose the question. Our desire is to develop relationships with churches willing to support our work with VFCM. If you are interested in supporting us in this area check out our Ambassador Support Letter. Feel free to contact us if you have any questions. 3. Monthly Financial Support - As career missionaries, we will be trusting God to work in the hearts of His people to meet our monthly financial needs. If you are interested in supporting us in this area check out our Financial Support Letter.